Bring attention to the entrance of your home or business and keep your guests and customers dry and safe as they enter into your doors. A Half-Barrel Tunnel Awning gives an elegant 1st impression and can be customized with your logo, address, or branding. Uncovered walkways, ramps and steps can be hazardous if they allow standing water. Keep puddles and ice from building up with a half-barrel tunnel. These welcoming designs are perfect for long walkways and add a touch of class too. 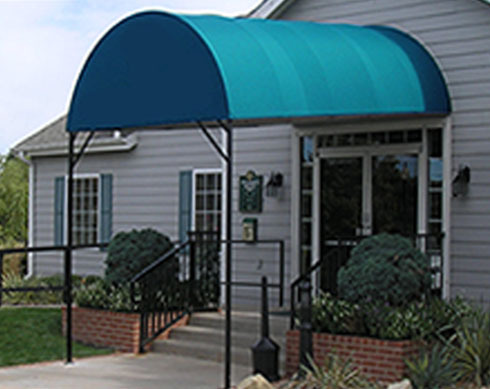 When placed correctly a half-barrel style awning can protect your interior from UV and sun damage, and can help lower cooling costs by limiting the amount of direct sunlight and damaging UV rays entering your home or business.